Only 13 of the 14 members of a party from the RAF Pathfinders’ Association were able to leave London last night on the association’s 21st anniversary visit to West Germany. Their chairman, Mr Dennis Wooley, a famous wartime bomber pilot had to stay behind because the Bank of England had refused to waive the £50 currency limit for foreign travel. Mr Wooley, who works for the Bank himself, had already spent £50 abroad this year. The Pathfinders were formed 25 years ago to guide the big bombers of the Allies to particularly difficult to find and heavily-defended targets. 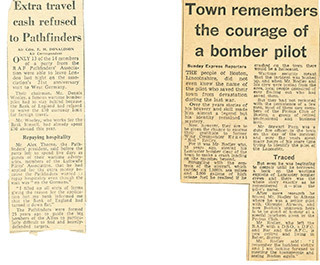 The people of Boston, Lincolnshire, did not even know the name of the pilot who saved their town from devastation during the last war. Over the years stories of his bravery and skill made him almost a legend but his identity remained a mystery. Now, however, they are to be given the chance to express their gratitude to former Wing Commander Ernest “Rod” Rodley. For it was Mr Rodley who, 33 years ago, steered his Lancaster bomber clear of the town to make a crash landing on the marshes beyond. Struggling with the controls of the aircraft which carried six 1,500lb sea mines and 2,000 gallons of high octane fuel he realised if he crashed on the town there would be a holocaust. Wartime security meant that the incident was hushed up, and when Mr Rodley and his crew were posted from the area, local people despaired of ever finding out who had saved them. But they had not reckoned with the persistence of a few men, most of them now members of the Probus Club of Boston, a group of retired professional and business men. 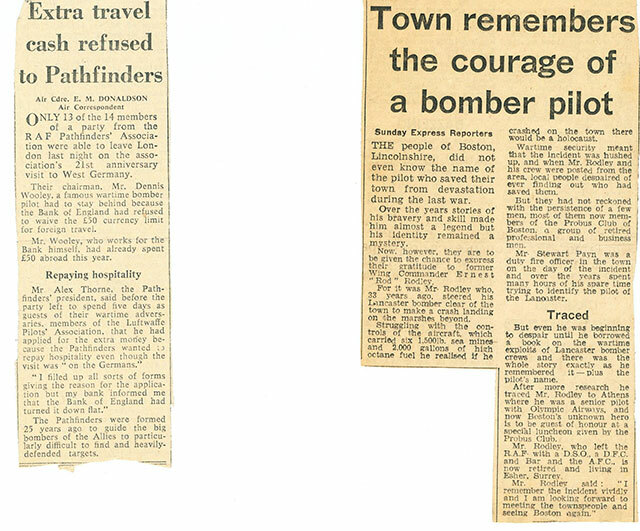 Mr Stewart Payn was a retired duty fire officer in the town on the day of the incident and over the years spent. 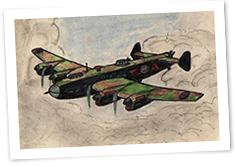 But even he was beginning to despair until he borrowed a book on the wartime exploits of Lancaster bomber crews and there was the whole story exactly as he remembered it – plus the pilot’s name. After more research he traced Mr Rodley to Athens where he was a senior pilot with Olympic Airways, and now Boston’s unknown hero is to be guest of honour at a special luncheon given by the Probus Club. Mr Rodley, who left the RAF with a DSO a DFC and Bar and the AFC is now retired and living in Esher, Surrey.